Tonight on Crossfire, we are diving into the crucial 2014 midterm primaries happening tonight in a half-dozen states. At 6:30pm ET, Brad Woodhouse of Americans United for Change and David Bossie of Citizens United join Van Jones and S.E. Cupp for a political debate, along with critical updates from CNN's Chief National Correspondent John King, Chief Congressional Correspondent Dana Bash and Wolf Blitzer. We want you to weigh in: Have Tea Party candidates made the Republican Party stronger or weaker? What future? What battle? There is no future for the republican party if it is comprised of people like the police chief in New Hampshire. What are you kidding? Guys like that remind me of white hooded ignorant bigoted fools who don't know dooodoo from shinola. Do republicans still participate in freemason secret ceremonies where they do vile things to young humans? that to me reminds me of the republicans as a party. What about Skull and Bones? Come on. Do you really want these evil greedy people ruining your lives anymore? The Tea Party IS for Fiscal Responsibility !!! Too many times the people have passed the buck on their own life and went to the government to bail them out. When some Social Program is put in place to solve some problem it never ends. Now we have a 17.7 Trillion dollar federal debt with no end in sight. When the end comes it is going to be brutal and bloody. Some say we need moderation. That's what got us in trouble in the first place. You"re poor. How's your SS and Medicare? The GOP call those programs "Social Welfare" and want to cut your benefits. How do you like your own party (GOP) telling you that you are on welfare? I think the media has made the tea party weaker. Their consistent death by a thousand slices approach to demonize their message has resulted in a lowering of public opinion about their movement. If you oppose the tea party, you pretty much oppose financial responsibility in government, however media sources have used pundits and other sources to discredit their name whenever possible. The tea party disrupted the complacency of the current sitting government and their supportive parties, apparently enough that the hornets flew out of the nest in a fit of desperation to drive off that disturbance. financial responsibility or as we call it gutting government agencies has resulted in chaos. You cant gut funding from agencies and expect them to run the same or better. Problems will occur, look at the VA. I have always believed in moderation. 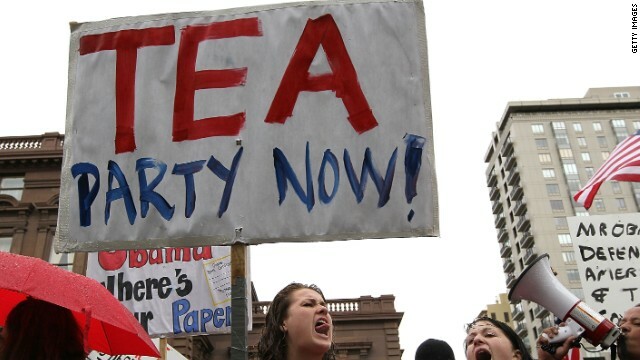 Tea partiers need to sit down and sip their tea. Look for moderation!!!!!!!! !